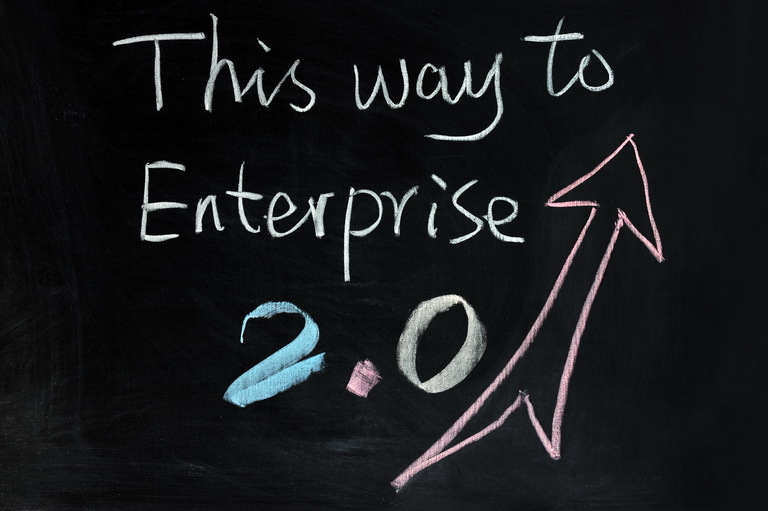 What do I have to know about Enterprise 2.0? Enterprise 2.0 refers to the concept of moving Web 2.0 tools and technologies into the enterprise to help your employees, partners, suppliers and customers work together to build networks of like-minded people and share information. The original concept of the Web was using websites to feed content to visitors but, Enterprise 2.0 turns this concept upside down. With implement of multiparty conversation Enterprise 2.0 lets you to share information and manage knowledge inside and outside the organization using blogs and wikis, social networking and tagging, rating systems and the like. These tools are linked together since the individuals who involved have the ability to participate and to control the process while they collaborate, share information and create networks of people with similar interests. In fact, tools to enable these functions have existed for a long time. But it used to be hard to find somebody who use it, despite the fact that it was really expensive to deploy these systems. Nowadays, since these tools are much easier to use, it has become more and more popular in the business world as an important component for knowledge management. In the 90’s there was an idea of managing knowledge and sharing information. The idea was to implement huge, all-encompassing enterprise-wide systems. Enterprise 2.0 while carrying on the spirit of the ideas, uses a simpler Web-based tool system, which makes it successful. The fact is, Enterprise 2.0 concepts are gaining credibility, and it’s not just startups that are paying attention to this space. Do we need a social intranet in the office?